One is not Hindu whose blood does not boil by the atrocities done on Hindu Saints by Congress which is heir to Mughal regime! The result of forcing non-vegetarian food! 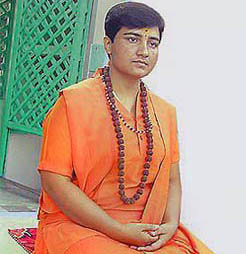 Few days back Shrimati Himani Sawarkar, President of Abhinav Bharat Sanghatana had revealed that Sadhi Pragya had expressed to her of her intention of taking ‘Samadhi’ in the jail itself if the jail administration continues with her torture.